You are buying the Kendall Kangaroo Feeding Gravity Set w/IcePouch & 1000ml Bag Each, model #8884712300. ADW Diabetes offers a complete line of Enteral Feeding supplies like feeding pumps, feeding tubes, feeding bags, and the related nutritional supplements. Trust ADW for all of your enteral feeding products. The Kendall Kangaroo Feeding Gravity Set with IcePouch & 1000ml Bag are available in large bore, 1000ml and with a proximal spike. They are also available in sterile and non-sterile and also DEHP-Free. 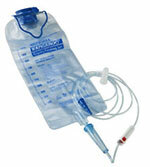 Kangaroo Enteral Feeding Gravity Sets are to be used in the absence of an enteral feeding pump.